Adorning your body with a tattoo is not a new concept. The earliest known tattoo was discovered on human skin dating over five thousand years ago. Until recently, tattoos were considered permanent. According to a small study in the journal, Contact Dermatitis, about 10% experiences some health issue after getting a tattoo. Of those experiencing a problem, six in ten were chronic (e.g., itching or swelling for years). For some, removing the tattoo is the best option to eliminate these problems. While many seeking a tattoo are concerned about the needles used in the process, few people know exactly what is in the ink. Tattoo inks are not closely regulated in the United States and different colors contain different chemicals. So, what do you do when your tattoo says you love Linda, but you’re engaged to Nancy? Until recently, the only options were laser or acidic removal. The Brannick Clinic uses the GoTattless method and our goal is to provide the most gentle, natural and relaxing process possible. We offer our non-laser tattoo removal treatments at all three of our offices. 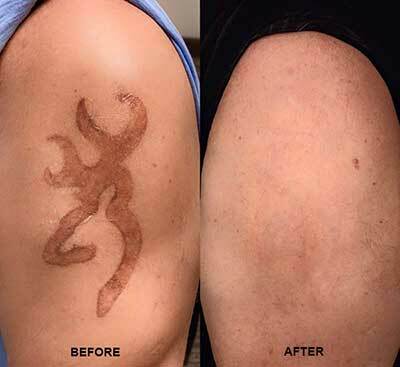 If you’ve been looking for a natural tattoo removal process, you can now find it at the Brannick Clinic. Call for an appointment.